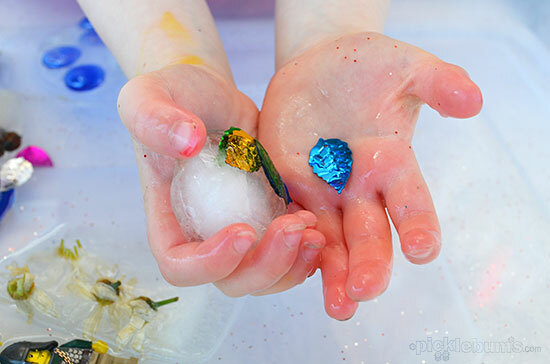 It’s hot today… so hot… And when it’s hot, or even when it’s not, one of my standby, easy sensory play activities is ice play. 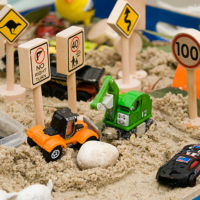 It doesn’t need to be a hot summers day to enjoy this easy sensory play idea. 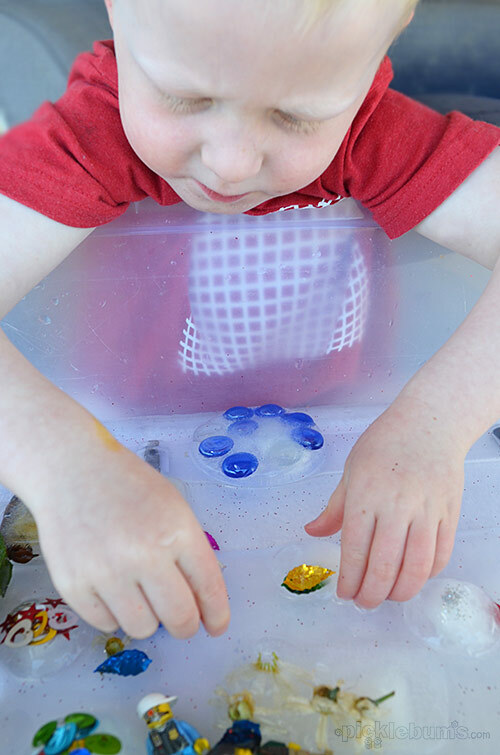 Ice is a fun, free, and awesome sensory play item. 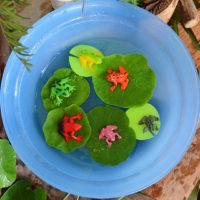 You can simple add ice blocks to a bowl, tub, or water table, or you can try this easy sensory play idea. 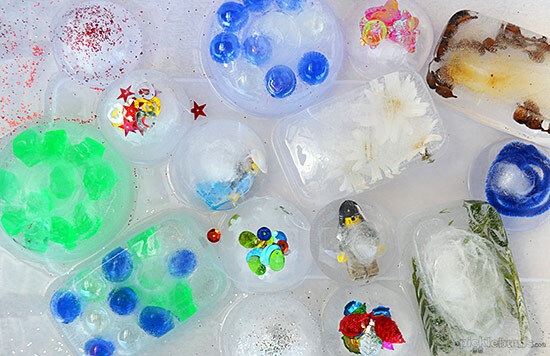 The only thing you need for this activity is a little forward thinking, some containers, some water, and some fun things to freeze into ice blocks. I set my big kids a challenge to come up with a list of things we could freeze into ice blocks. They spent the morning looking for small treasures we could freeze and writing lists. Here is the list of ideas they came up with. We used recycled yoghurt containers and other small storage containers to freeze our treasures. And once they are all frozen you get to play! 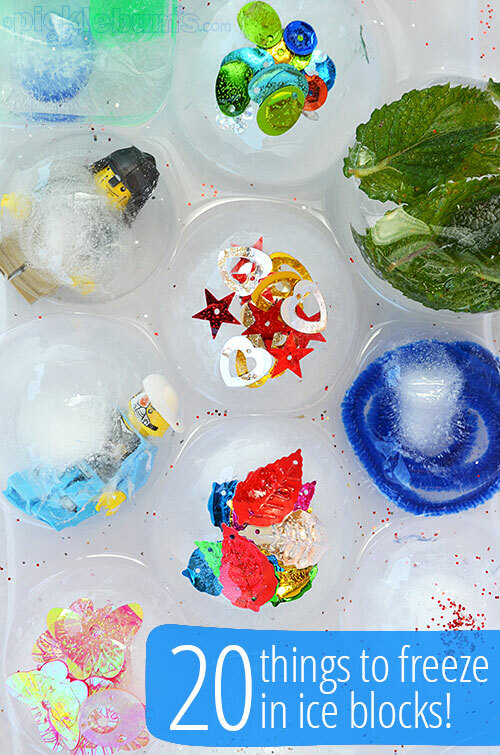 Dump your ice treasures into a big tub (we use a cheap under bed storage container), add some scoops, eye droppers or small containers, and a little water to help get things melting. Everyone loved pouring water over the treasures and watching them slowly emerge from the ice. You could also add a hammer and screwdriver for bigger kids to chip away at the ice. Please be aware that some of these items are very small when they melt out of the ice blocks and may not be suitable for children who still put things in their mouths. What cool freezable things would you add to our list?? 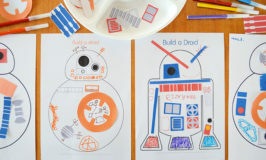 Or check out this article for even more easy sensory play ideas. What a FABULOUS and very simple idea. Perfect for these hot days. Mummy’s credit card if it is maxed out with debt!! This was brilliant! One kid went and collected outside things, the other inside things. We then looked at what floated and what sunk as we out the water in the tray. Then, as they watched the ice melt, we separated some and added sprinkled salt over them to see how they salt made them melt faster. They then watched and realised that all of the items they had frozen that had salt in them … The sand, the shell, the playdough … All melted more quickly than the other things. Also they noticed the bigger things melted quicker than the smaller things, because there was less water that fit into the cube. What a sensational science lesson that captivated our morning and late arvo. Thanks!!! Love this! 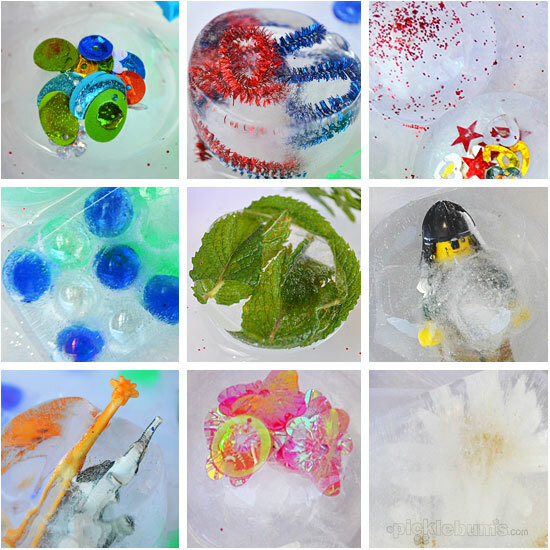 Great idea to challenge the kids to set about finding the things to freeze. We’ve been doing things with ice lately too so we’ll have to give this a go. thanks! 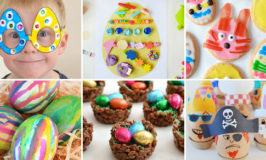 For kids who put things in mouth what would u suggest to freeze instead? I had never thought to freeze things like this, but what a great idea! Keeping this one in mind for the hot summer! We’re going to have the coolest ice in the neighborhood! lol! Such a great idea. It\’s been a brutal summer in Australia and this is a perfect activity.for the kids in the heat. Thanks for the inspiration!